Greenville is a charming Texas town with a rich history and a dynamic lineup of activities for all kinds of travelers. Its historic downtown, with its blend of preserved heritage, emerging arts scene, and multiple performance venues will surprise you! The area is a hub for great shopping, dining, and entertainment opportunities. And thanks to the city’s setting, some of the best activities involve the natural wonders of North Texas, from its lakes and prairies to its history of cotton production. Below are just a few of the best things to do in Greenville when you visit. The jewel of Greenville is its historic downtown area where you'll find unique shops, restaurants, beautiful murals, and displays of public art that will soon include interactive artworks. Take a walking tour to the six downtown locations listed in the National Register of Historic Places, and learn town trivia like why Elvis once came to town from the markers on Main Street. For shopping, your options will vary widely from antiques, jewelry, and gift shops to art galleries, home improvement stores, and clothing boutiques. When you need a rest, stop at the Heritage Garden on Washington Street and enjoy the native Texas plants growing there. For a bit of refreshment, grab a table at Landon Winery and have a glass of award-winning Texas wine. On Saturdays, go for a leisurely stroll through the Farmers Market at Market Square and browse the locally grown produce and hand-crafted furnishings. Greenville is known for producing two things: cotton, and the most decorated soldier in World War II. 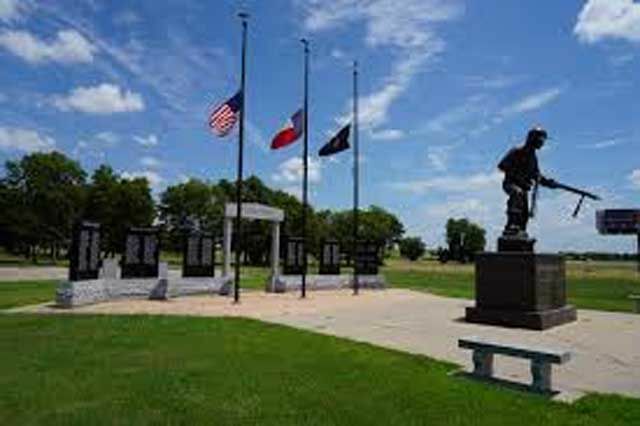 For more than 20 years, residents have memorialized both at the Audie Murphy/American Cotton Museum. Open five days a week, the museum honors the war-time achievements of young Murphy, who won every possible medal granted by the U.S. Military, as well as other vets at the recently opened Hall of Heroes. Other military exhibits include a walkable World War I trench and an armory of antique guns. The section of the museum that focuses on cotton includes the engine of the compress from what was once the largest inland cotton compress in the world. Meanwhile, the museum’s newest exhibit takes you back in time to Downtown Greenville at the turn of the century. Don’t forget to walk the grounds around the museum, where you’ll find the Ende-Gillard House, the oldest standing house in Greenville, and a 10-foot bronze statue of Murphy. Perhaps no other city in Texas is as perfectly placed as Greenville when it comes to lake access. No less than five large lakes are within 30 miles of the city, each providing fantastic opportunities for fun in the sun. To the northeast of Greenville, Jim Chapman Lake (formerly Cooper Lake) is known as an excellent fishing hole for catfish and hybrid bass. For largemouth bass, you’ll want to head to Lake Fork, southeast of Greenville near Emory. The lake currently holds the record for the top six biggest largemouth bass ever recorded in the state. Directly south of Greenville along Highway 34, Lake Tawakoni beckons with boat and jet ski rentals, as well as some solid fishing of its own and even opportunities for hunting. Head west of Greenville and you’ll find two more lakes: Lake Ray Hubbard and Lavon Lake. At 22,000 acres, Lake Ray Hubbard is one of the largest lakes in North Texas. That means no matter how you prefer to enjoy a day at the lake, you can probably do it here. In addition, the lake features half a dozen parks along its banks, as well as a number of waterfront restaurants and bars. Lavon Lake is almost as big as Lake Ray Hubbard and in addition to its plethora of aquatic activities, it has more than 160 campsites. The thriving Greenville music and theater scene helps make the city a top destination for anyone who enjoys the arts. Thirty-five years after closing its doors, the newly resurrected Texan Theater returned in 2014 to offer Greenville an intimate venue for film screenings, plays, and live music by some of the country’s top artists. Each show includes a four-course meal, drinks, gratuities, and free parking. A newer addition to Greenville’s entertainment lineup is the Bob Wills Fiddle Festival and Contest, held annually in October. Fiddlers from around the world converge in downtown Greenville for a weekend of concerts, contests, and fun! One of Greenville’s oldest venues is the Greenville Municipal Auditorium, home of a variety of entertainment ranging from the Dallas Symphony Orchestra to legendary country artists. Several restaurants and pubs around town offer live music, along with karaoke nights and open mic nights if you’re struck by the urge to make some music of your own.